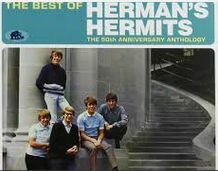 Hard to believe - and I confess that I actually purchased this 1965 album - Herman's Hermits had 3 of the top 100 hits of 1965 - No, wait ... Wikipedia says 4! I'm even more contrite about the fact that I collected this stuff after listening to the clips below, but ... that's what it was back then. Top 10.. gotta buy it. The power of the media - AM radio was the media venue we all followed and it (in retrospect) appears to have dominated not just the air waves. Be that what it may, Herman's Hermit's were hot. Top of the Pops. We've got Peter Noone (aka Herman) doing vocals with a bit of a put-on accent - see Mrs Brown, Derek Lekenby on lead/solo guitar - see Henry the Eighth. And- apparently typical of Mickie Most's production style - some additional musicians doing things like keyboards that aren't visible in the stage versions below.